It seems weird to be posting a *normal* recipe today. And by *normal,* I mean something that is not centered around the holidays or contains 5 pounds of butter and 3 cups of sugar. *Normal*as in “real food” – for dinner (because despite what you think sugar cookies and fudge, aren’t suitable for dinner!). Ok, I know you can’t eat cornbread for dinner alone, but it does make a good side dish for soup, chili, and BBQ chicken. Or just slathered with butter and drizzled with honey! 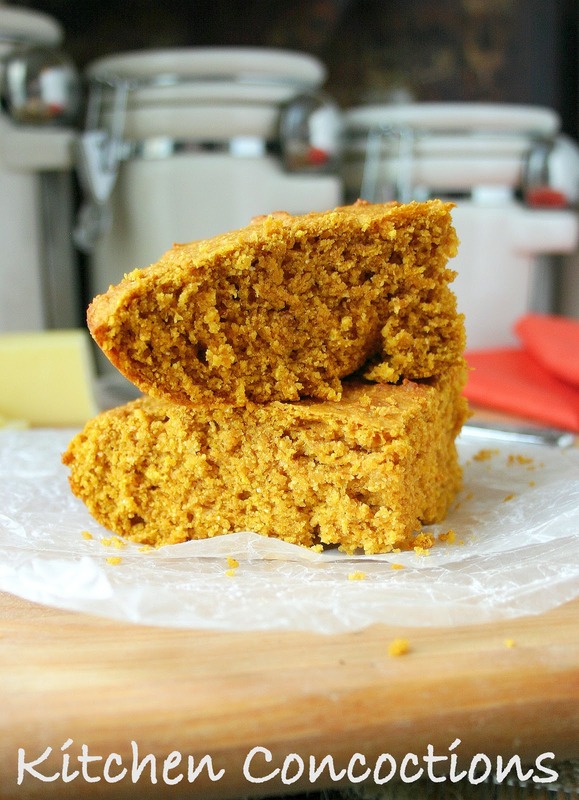 We enjoyed this pumpkin version of cornbread both ways as a snack with honey and butter and as a side to some hearty fall chili (full of sweet potatoes, pumpkin and other fresh fall flavors)! 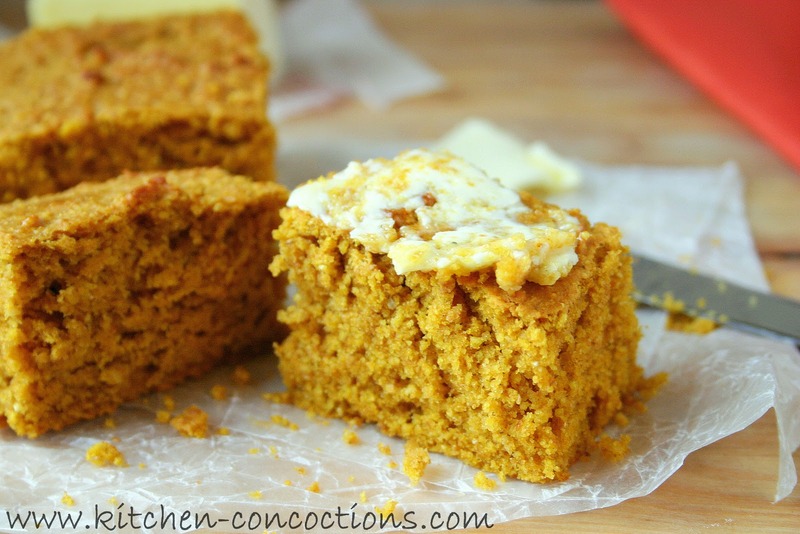 I loved the touch of spices, hint of sweetness and lovely pumpkin flavor this cornbread had! Perfect for eating any way you like! Preheat oven to 400°F. Grease 10-inch glass pie pan or 9-inch square baking pan. In a large bowl stir together flours, baking powder, salt, spices, cornmeal and brown sugar. Stir until fully incorporated and no clumps, breaking up brown sugar as needed. In separate bowl, beat eggs lightly. Whisk in pumpkin, oil and molasses. Stir pumpkin mixture into dry ingredients mixing just until blended, using caution not to over-mix. Pour batter into prepared pan. Bake for 20 minutes, or until cornbread is lightly browned and tester inserted in center comes out clean. *Note: Add sugar based on desired sweetness. 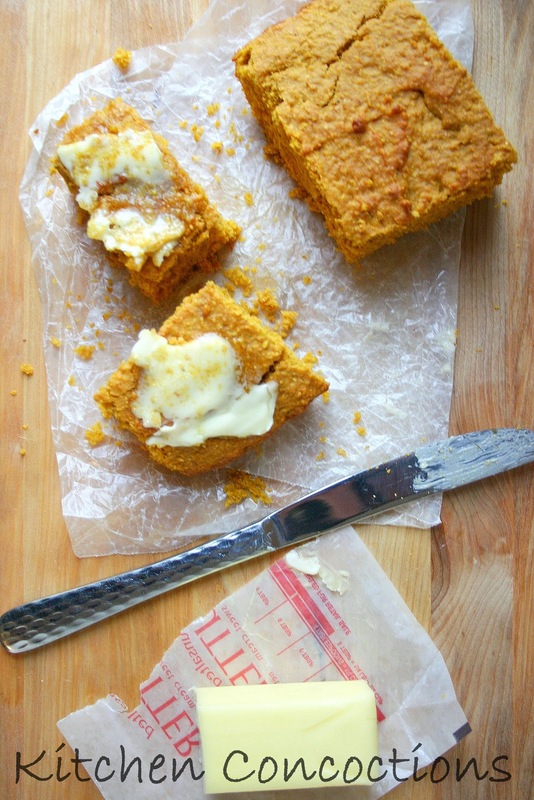 Linking this recipe up to Taste and Tell Thursday for a chance to win a Smuckers prize pack! I love this – it would be so perfect with a bowl of chili!! Thanks so much for linking up to Taste and Tell Thursdays!